In the woods of Northampton, Mikey is irritably stomping around, trying to call Raphael in for dinner. Raphael eventually drops down from the treetops, but he’s in no mood to talk. A quick glimpse at Raph’s face shows Mikey that his brother has been crying and immediately he tries to discern what’s wrong. Raph is reluctant to share his troubles and pushes Mikey away. Mikey persists and Raph finally concedes. He tells Mikey that he got to thinking about their future as a family and that led him to think about what they would do when Master Splinter died. Unfortunately, he couldn’t escape the thought and eventually worked himself up, leading to tears. 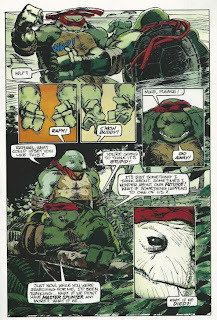 Michelangelo places a hand on Raph’s shoulder and tells him that what he’s been thinking about is perfectly natural; that it’s something every one of them has thought about at one time or another and had the same reaction. The only difference is that Raph puts on such a tough guy façade that it’s difficult for him to cope with his emotions or share them with his family. Mikey tells Raph that all they can do is spend as much time together as a family as they can and make many happy memories. Together, they walk back toward the farmhouse for dinner. Wiping his tears away, Raph thinks to himself that Mikey can be a real doofus. *As A.C. Farley’s stories in TMNT (Vol. 1) were not considered “canon” by Peter Laird, it is questionable what the canon status of “Crack in a Hard Heart” is. Honestly, it’s a great story and it doesn’t contradict anything, so I’d just as soon keep it. As with “Fifteen Years Later...”, this contribution to Turtle Soup by A.C. Farley is one of the highlights of the entire volume. 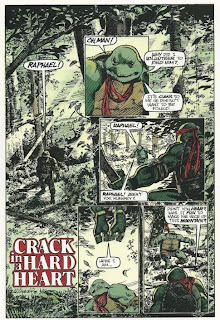 Turtle Soup was rife with character vignettes, many of which were cheesy or ill-executed (“The Purpose of Fear” comes to mind), but “Crack in a Hard Heart” is a somber tale that deals with a very real fact of growing up, reminding us that the Ninja Turtles are still teenagers. Barring any unforeseen accidents or illnesses, we’re all going to outlive our parents. It’s just a simple fact of life. When we’re kids, we don’t often ponder this, as we’d like to think our parents will be around forever. But part of growing up is accepting that we’ll eventually have to say goodbye and it’s not an easy reality to face. For the Turtles, Splinter is more than just a father; he’s their teacher, their mentor, their hero and so much more. It’s plain to see how lost they would feel upon losing him, at least from the perspective of a teenager not yet equipped to face the world alone without a father’s guidance. And what with Raph being the “loner” of the group, he doesn’t have his brothers to share with and fall back on (or at least he thinks he doesn’t), so the realization of Splinter’s mortality hits him as a heavier burden than the rest, perhaps. 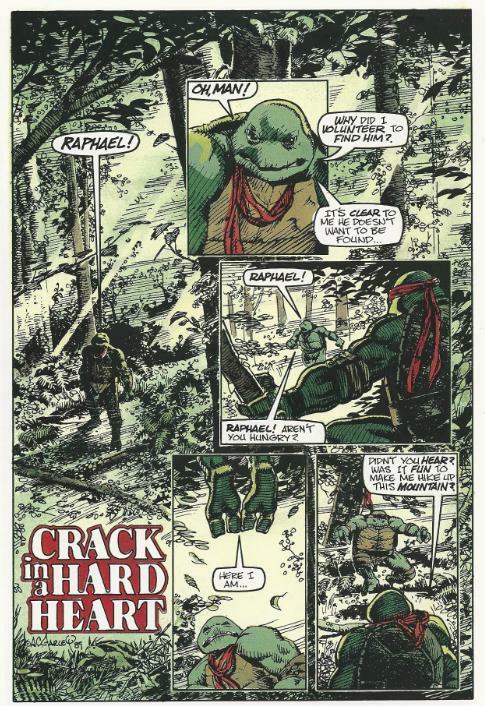 One of my favorite details about “Crack in a Hard Heart” is that Farley elected to pair Raph with Mike, recalling the close bond they shared in the earliest Mirage TMNT stories. That “family within the family” dynamic was quickly lost as Raph became fulltime buds with Casey, but stories like this serve as a reminder that Raph and Mike at one point shared a bond stronger than they did with their other siblings. And even with all the sappiness of the subject matter, it ends with Mikey saying something intentionally saccharine and Raph sighing at his bro’s goofiness. The “punchline” at the end doesn’t distract from the subject matter, but it does take the edge off a bit and maintain their relationship and personalities. Mikey and Raph can share these “tender moments”, but one’s still a goof and the other’s still a jerk. Farley draws the Turtles looking very “wrinkled”, which kind of downplays their status as teenagers, but at the same time, he knows how to make them emote perhaps better than any other artist to tackle the characters. There’s a soulfulness to their eyes that sells the drama of the situation. And Richomond Lewis’s colors are icing on the cake, creating a shadowed, late afternoon atmosphere that bathes the entire setting in a reflective ambience. While “Crack in a Hard Heart” might seem like a lot of excessive drama, I think it reads best as a breather in between full-length issues or story arcs. It’s a moment for the characters to stop and consider their own mortality and the mortality of their loved ones; a rare bit of character growth all-too absent in the crazy, episodic storytelling of the TMNT Vol. 1 era.